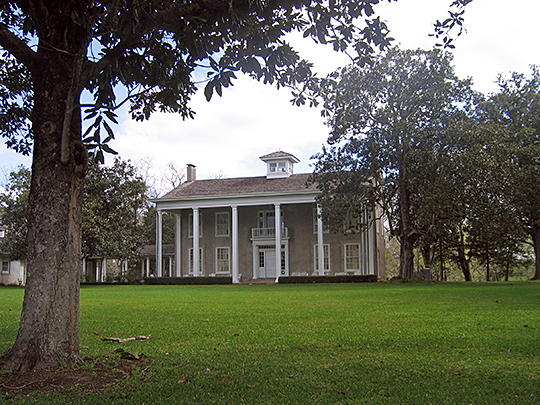 Photo: Varner-Hogg Plantation, ca. 1830s, northeast of West Columbia, Brazoria County, Texas. Listed on the National Register of Historic Places in 1980. Photographed by User:Karanacs (own work), 2008, [cc-by-3.0 (creativecommons.org/licenses/by/3.0)], via Wikimedia Commons, accessed April, 2013. The Brazoria County Courthouse is located at 111 East Locust Street, Angleton, TX 77515; phone: 979-864-1355. Brazoria's county motto is Where Texas Began. County of Brazoria, Texas, www.brazoria-county.com, accessed September, 2011.